Go to original pattern for design DROPS 192-17. 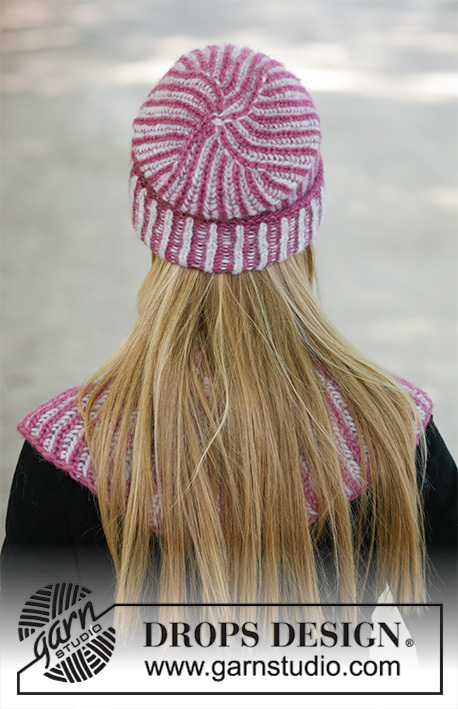 Knitted hat in DROPS Air with English rib in two colours. 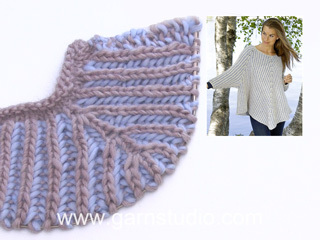 Knitted neck warmer in DROPS Air with English rib in two colours. Circumference approx. : 54-64-73 cm at the top and 76-89-102 cm at the bottom. 13 stitches in width and 18 rows (counted in knit stitch) vertically with English rib = 10 x 10 cm. DROPS CIRCULAR NEEDLE SIZE 6 mm, length 40 cm. 11 stitches in width with English rib = 10 cm in width. ROUND 1: Work with heather. Work * 1 yarn over, slip 1 stitch as if to purl, knit 1 *, work from *-*. ROUND 2: Work with pearl grey. * Purl together yarn over and slipped stitch, 1 yarn over, slip 1 stitch purlwise *, repeat from *-*. ROUND 3: Work with heather. Work * 1 yarn over, slip 1 stitch purlwise, knit together yarn over and slipped stitch *, work from *-*. Repeat rounds 2 to 3. All decreases are done on 1 round with heather! Work to stitch with marker, slip (as if to knit together) yarn over and knit stitch, knit the following 3 stitches together (= knit 1, 1 yarn over, purl 1), pass yarn over and slipped stitch over (= a total of 4 stitches decreased). Decrease like this at every marker (= 8 stitches decreased). All increases are done on 1 round with heather. Increase in knit stitch as follows: Work 5 stitches in stitch and yarn over as follows: * Knit yarn over and stitch together but wait to slip stitch on to right needle, make 1 yarn over on right needle *, work from *-* 2 times in total and knit stitch and yarn over together 1 more time = 5 stitches (= 4 stitches increased). On next round work the increased stitches in pattern. On the next row work the stitches into the pattern. NOTE: work each increased stitch individually (do not work yarn over and stitch together). Cast on 81-84-87 stitches on circular needle size 6 mm with heather. Purl 1 round. * Purl 1, purl 2 together *, work from *-* = 54-56-58 stitches. Then work ENGLISH RIB IN TWO COLOURS - read explanation above = 27-28-29 knit stitches. Work 1 stitch English rib as before (=1 yarn over, slip 1 stitch), slip yarn over and knit stitch on to right needle as if to knit together knit the following 3 stitches together (= knit 1, 1 yarn over, purl 1) and pass yarn over and slipped stitch over, work the rest of round as before. Work 1 stitch English rib as before, insert 1 marker in next knit stitch, work 11-13-13 stitches English rib as before, insert 1 marker in next knit stitch, work 13 stitches English rib as before, insert 1 marker in next knit stitch, work 11-13-13 stitches English rib as before, insert 1 marker in next knit stitch and finish with 13 stitches English rib as before. On next round with heather, decrease 2 stitches at every marker – read DECREASE TIP. Decrease like this every 4th round (i.e. every other round with heather) 5-6-6 times in total = 12-8-8 stitches. 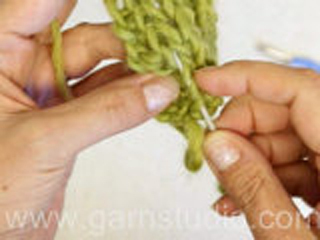 Pull a double yarn through the remaining stitches and fasten tightly. Hat measures approx. 31-32-33 cm. Fold the hat approx. 5 cm upwards. Cast on 90-105-120 stitches on circular needle size 8 mm with heather and work in the round on circular needle. Knit 1 round. 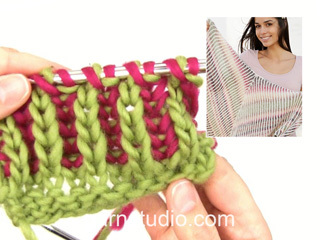 Work as follows: * Purl 1, knit 2 together *, work from *-* = 60-70-80 stitches. Then work ENGLISH RIB IN TWO COLOURS - read explanation above. REMEMBER THE KNITTING TENSION! When neck warmer measures 12 cm, increase 4 stitches in every 5th knit stitch (i.e. 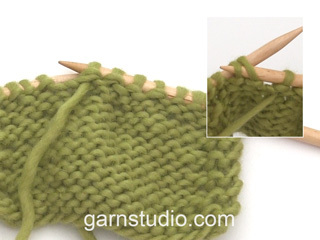 every 10th stitch) - read INCREASE TIP = 84-98-112 stitches. Continue in the round with English rib in two colour until neck warmer measures 20-21-22 cm, adjust to work next round with heather. 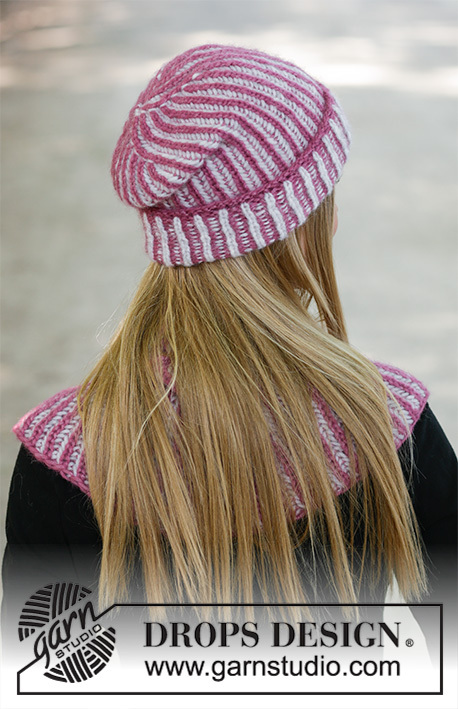 Cast off with heather, with knit over knit and purl over purl, cast off yarn over together with knit stitch. Bonjour Mme Gillam et merci. Les côtes anglaises bicolores se tricotent avec alternativement l'une et l'autre couleur, mais, en tricotant alternativement avec l'une et l'autre couleur le jeté et la m glissée (tour 2 en gris perle) et le jeté et la m glissée (tour 3 en bruyère), on va obtenir les rayures verticales. Cette vidéo montre les côtes anglaises en allers et retours mais vous permettra de visualiser comment en tricotant 1 rang de chaque couleur, on obtient des rayures verticales. Bon tricot! Liebe Frau Retzlaff, es sind 50 g (= 1 Knäuel) Air je in Farbe 14 und in Farbe 03 pro Grösse (= 100 g insgesamt in jede Grösse). Viel Spaß beim stricken!